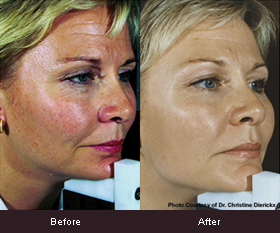 IPL Rejuvenation was designed to combat the effects of aging and damaged skin in a softer, gentler way. The redness and flushing of rosacea can be reduced 80 to 90 percent. It can be used to treat the full face, neck, chest and even the hands. Using the advanced IPL system, your doctor gently delivers precise amounts of light energy through your skin’s surface. Treatments are spaced out at three week intervals. The energy is delivered at specific settings for each treatment to maximize your results. The light energy stimulates the production of collagen. As the new collagen forms, it softens the appearance of aging skin. Fine lines and wrinkles are decreased. The redness associated with rosacea can be dramatically reduced.